The Norwegian Elkhound is one of the most ancient breeds in existence. The breed originated in Scandinavia over 6,000 years ago. A skeleton dating back to 4,000-5,000 B.C. was found and is believed to be that of an ancient Norwegian Elkhound. The name Norwegian Elkhound translates to “Norsk Elghund” which literally means Norwegian moose dog. The breed is also referred to as the Norsk Elghund Gra and Norsk Elghund Sort. The Norwegian Elkhound was utilized by the vikings to hunt both small and large game. It was not uncommon for a Norwegian Elkhound to hunt large game such as elk, mountain lion and bear as well as small game such as badger or rabbit. This is a very versatile hunter that will hold its prey at bay, barking until the hunter has arrived to claim his prize. The Norwegian Elkhound is also regarded as an excellent sled dog. Also, the Norwegian government has given their Defense Minister the power to mobilize all privately owned Norwegian Elkhound during times of war. In more recent years, the Norwegian Elkhound has gained popularity in private homes as a family companion. The American Kennel Club first recognized the Norwegian Elkhound in 1913. The Norwegian Elkhound male will typically reach heights of 19-21 inches tall and an average weight of 50-60 pounds. The female Norwegian Elkhound will typically reach heights of 18-20 inches tall and an average weight of 40-55 pounds. The Norwegian Elkhound's coat is made to endure the fiercest cold weather conditions. The heavy double coat feels thick and hard to the touch. The coat is gray with black at the tips and a lighter colored undercoat. The ears, muzzle and tip of the tail are black. Norwegian Elkhound puppies are born with an entirely black coat that will develop into the standard coat at around a week old. The Norwegian Elkhound is a very intelligent, friendly and loyal breed. They will bond easily with family, but will be inseparable from their leader. This breed is quite sensitive and their feelings are easily hurt if they feel deserted. The Norwegian Elkhound is a very willful breed that will require extra attention in obedience training. The Norwegian Elkhound is very smart and has the ability to learn commands quickly, but may choose not to follow them if there is something more interesting going on. It is up to the owner to make the dog understand the importance of their commands. A Norwegian Elkhound without enough exercise can become very high strung and even destructive, so it is imperative that plenty of physical as well as mental exercise be provied. The Norwegian Elkhound is a very intelligent, friendly and loyal breed. They will bond easily with family, but will be inseparable from their leader. This breed is quite sensitive and their feelings are easily hurt if they feel deserted. The Norwegian Elkhound is a very willful breed that will require extra attention in obedience training. The Norwegian Elkhound is very smart and has the ability to learn commands quickly, but may choose not to follow them if there is something more interesting going on. It is up to the owner to make the dog understand the importance of their commands. A Norwegian Elkhound without enough exercise can become very high strung and even destructive, so it is imperative that plenty of physical as well as mental exercise be provied. The Norwegian Elkhound is an alert, affectionate and protective breed whose distinct bark makes them an excellent watch dog. The Norwegian Elkhound will be reserved and suspicious around strangers, but will greet known family friends with enthusiasm. This breed is known to get along well with children, but it is imperative that the dog understand the child(ren) out rank him. The Norwegian Elkhound is a hunting breed and so is not recommended for homes with small pets such as hamsters, rabbits or gerbils. Much socialization from a young age would be required to ensure the Norwegian Elkhound understands that the small pets out rank him in the pack. The Norwegian Elkhound is also known to be aggressive towards other dogs and should be well socialized in an attempt to prevent that. You can find Norwegian Elkhound puppies priced from $450 USD to $800 USD with one of our credible breeders. Browse through our breeder's listings and find your perfect puppy at the perfect price. The Norwegian Elkhound is an alert, affectionate and protective breed whose distinct bark makes them an excellent watch dog. The Norwegian Elkhound will be reserved and suspicious around strangers, but will greet known family friends with enthusiasm. This breed is known to get along well with children, but it is imperative that the dog understand the child(ren) out rank him. The Norwegian Elkhound is a hunting breed and so is not recommended for homes with small pets such as hamsters, rabbits or gerbils. Much socialization from a young age would be required to ensure the Norwegian Elkhound understands that the small pets out rank him in the pack. The Norwegian Elkhound is also known to be aggressive towards other dogs and should be well socialized in an attempt to prevent that. The Norwegian Elkhound's coat requires a good deal of grooming, but the upkeep is simple. The coat should be brushed on a regular basis, with emphasis on the time of year when the Norwegian Elkhound sheds his undercoat. A rubber brush or a comb with double rows of metal teeth should be used to remove the dead hair that clings to the new hair. Excessive bathing will remove the natural oils of the Norwegian Elkhound's skin, so baths should only be given when necessary. This breed is a heavy shedder on a seasonal basis, however, there's none of that pesky dog smell from this arctic breed. The Norwegian Elkhound, while very intelligent, is also very independent. This breed will learn commands with ease, however, they may not always follow them. It is necessary to be a very firm and consistent pack leader with this breed to ensure they know who's boss. Rules must be laid out for the Norwegian Elkhound and followed rigorously to ensure the dog does not develop bad behavior. It is necessary to make it clear to this dog that they do not out rank any member of the family. The Norwegian Elkhound would do okay in an apartment if given sufficient exercise. The breed is relatively active indoors and will be happiest if provided a yard to play in. 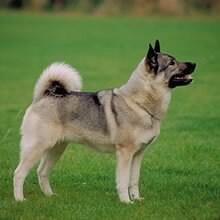 The Norwegian Elkhound will require a long and brisk walk or jog on a daily basis, as they are very energetic. The Norwegian Elkhound will be happy to jog with you or run alongside your bicycle, however, you must keep the dog on it's leash. The Norwegian Elkhound is a hunting breed and is known for roaming. If they find an interesting scent, you will be hard pressed to gain their attention. Norwegian Elkhound Puppies for Sale - Shipped Worldwide! Finding the right Norwegian Elkhound puppy can be dog gone hard work. PuppyFind® provides a convenient and efficient means of selecting and purchasing the perfect Norwegian Elkhound puppy (or Norwegian Elkhound puppies) from the comfort of your home, 24 hours a day, 7 days a week. Take advantage of our PuppySearch or leisurely browse our directory of hundreds of dog breeds, Norwegian Elkhound dog breeders, Norwegian Elkhound dogs for adoption, and Norwegian Elkhound puppy for sale listings with photos and detailed descriptions. Some Norwegian Elkhound puppies for sale may be shipped Worldwide and include crate and veterinarian checkup. Many Norwegian Elkhound dog breeders with puppies for sale also offer a health guarantee. With thousands of Norwegian Elkhound puppies for sale and hundreds of Norwegian Elkhound dog breeders, you're sure to find the perfect Norwegian Elkhound puppy.